Every year we have a celebration in our county called the "Pioneer Reunion". It's a HUGE deal - 3 days and nights of parades, courthouse lawn festivities, rodeos and dances. All three days, the county seat is FILLED with cowboys, cowgirls and horses. 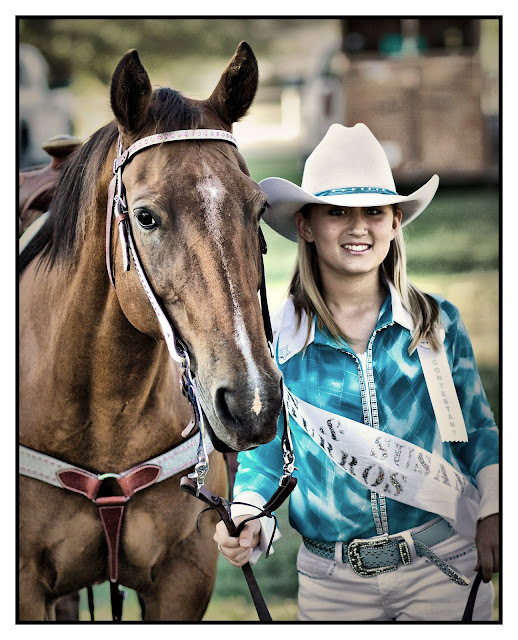 This is one of Becca's friends who was a candidate for Junior Rodeo Queen. Thanks for looking!!!! What a beautiful shot! I really like your pp. Great shot! I bet she'll love this! Oh, the processing is really cool looking and just so you know...we don't ever mind football pics, keep em' coming. LOVE your processing. Gorgeous shot. The processing on this works great with the shot! I enjoy your football photos a lot since I (try to) shoot HS football too.